Here you will find a professional, reliable and complete assistance for researching and experiencing your family history in Southern Italy. Residing in the Abruzzo region of Italy, we provide a first-hand research based on the original historical document sources. We also help you plan your travel in Italy and guide you on custom-tailored day trips. Feel free to take a look at our services and do not hesitate to contact us for further information or to request a quote. Either if you want to discover your Italian heritage, but you hardly know where to begin, or if you’ve been working on your family tree for decades, but you bumped into a blind alley, our research services can always be tailored for you. In your next trip to Italy make sure to spare some time in Abruzzo or Molise to know more about your ancestors’ place of origin. We will ensure that the visit to your grandparents’ places will be a once in a lifetime experience. The circumstances of life led your family to loose connections with relatives still living in Italy and their descendants? Get now to find them, establish a connection, and possibly meet them on your next trip to Italy. If you didn’t see the perfect solution for you among the listed services, we can still provide a tailor-made service for your specific needs. Our main research focus is on Southern Italy. In particular, being based locally, Abruzzo and Molise are our favorite research locations. 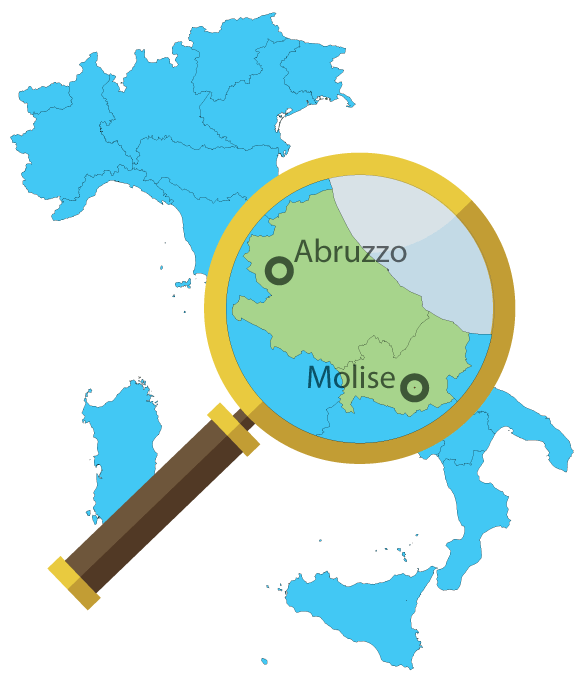 For your convenience, we prepared pages about all cities and towns in Abruzzo and Molise, providing main useful information to get started with your research, or just to learn more about the place of origin of your ancestors. Your comments on the pages usually provide a great way to leave a track of your specific research interest and to get in touch with other users possibly interested in the same family. We always deal with your family history research in person, and take very seriously our commitment to you. We apply all the best practices of genealogy research, documenting all the single steps done and providing you with a complete set of information products, including copies of the original records. We are completely aware that dealing with personal information, family memories and relational aspects, requires our best qualities of sensitivity and care. Emidio was a pleasure to work with! It was exciting to see a copy of my Grandfather's birth record! Emidio's well-written reports and attention to detail in citing his sources were excellent. Always willing to answer questions about the history of Italy and what life may have been like, made me feel like I was stepping back in time, getting to know how my ancestors lived. I would definitely recommend Emidio's services! Knowledgeable, friendly, professional.. I could go on and on. Emidio puts in 110% and is great at what he does. I'm very grateful for all of his help in my pursuance of dual citizenship. I can't say enough good things about Emidio. I hit a brick wall when researching my maternal grandmother's history. Emidio was able to determine why I was unable to find the information and then to trace her lineage for several generations. Also, I am in the process of applying for Italian citizenship. One of my first steps was to see if I could obtain official records of my grandparents' birth and marriage records from their respective communes. Emidio retrieved sic official, sealed records from three different communes. This was of immeasurable value to me. He's the absolute best! Extremely happy! Emidio and Elif were delightful travel guides. Emidio's research was the very best. He went above and beyond to make possible to learn about my roots in Molise. I cannot thank him enough for making a dream come true.